ACO’s full line of Double Wall Tanks provide the best protection and peace of mind for chemical storage applications. Consists of a primary inner tank and secondary containment tank, with a capacity of 120% of the inner tank. 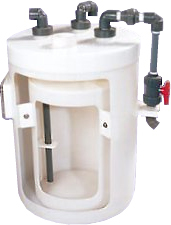 We recommend double wall tanks be supplied with a top suction line to avoid any holes below the water line. Inner tank dome overlaps outer tank sidewall to prevent rainwater, snow and debris from entering into the containment basin. Narrow design is ideal for space saving. Molded-in lifting lugs (large tanks only) and upper fitting flats are standard. Molded-in lower fitting flats can accommodate our sturdy optional bottom outlet.